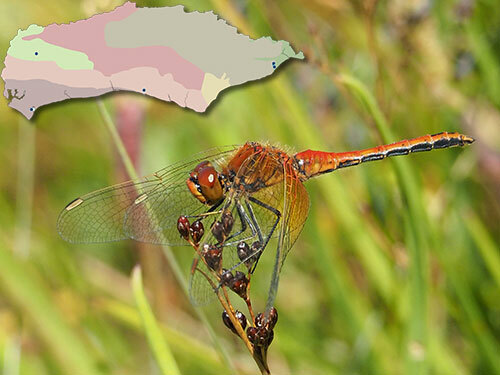 August, 2018’s species of the month: The Darters - Sympetrum spp. 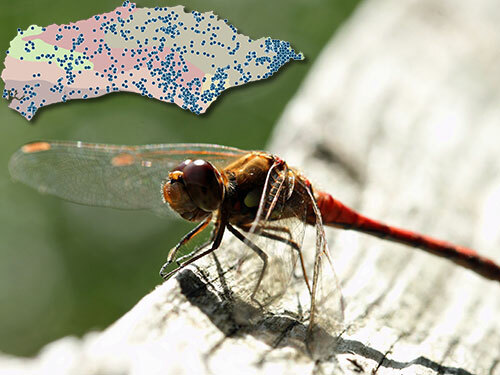 Of the 25 species of dragonfly that have been recorded in Sussex in the 21st Century, probably the commonest (and certainly the most recorded) is the Common Darter (Sympetrum striolatum). In total the SxBRC has 7500 records for this species, 4502 of which have been gathered since the year 2000. 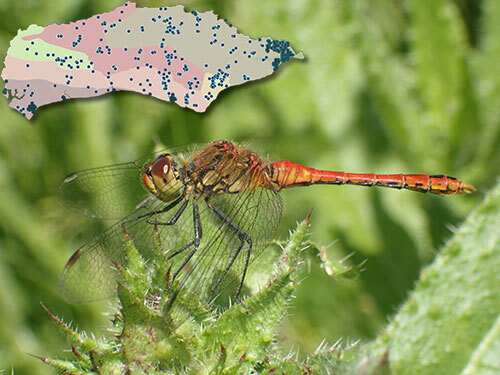 The Common Darter though is just one of seven Sympetrum species that have been recorded in the UK, all but one of which have been recorded in Sussex. All except the Black Darter (S. danae) are superficially similar in appearance and a little bit of care is needed in order to correctly identify them. Black Darter however, is our smallest dragonfly and mature males are almost completely black, the females are easily recognised by their distinctive half and half abdomen - yellow on top and black below. It is a species that is mostly restricted to ponds in our heathland sites and not likely to be encountered in the wider countryside. The remaining species however are less distinctive and possibly for that reason, somewhat less recorded. The most frequently encountered of these are Common Darters (S. striolatum) which have black legs with a yellow strip along their length, a brown thorax and eyes that are brown on top and yellowy-green below. The males, when mature, have a bright red abdomen and the females yellow-brown. The thorax and abdomen of male Ruddy Darter (S. sanguineum) is, as its Latin name suggests, blood-red in colour, and it can easily be distinguished from a male Common Darter by the club-shaped abdomen, entirely black legs and an orange-yellow coloration at the base of its wings. Although the Common Darter is generally more abundant both of these two species are often found together around well vegetated, shallow water bodies or further afield, often in woodland rides. The remaining Sympetrum species recorded in Sussex are migrants and much less frequently recorded. Being migrants they can appear almost anywhere but are more likely to be found, like the other darters, around shallow ponds and ditches with plenty of emergent vegetation. Red-veined Darter (S. fonscolombii) is the most often seen, with 38 records so far this century. The mature males have bright red bodies with a red veination to their wings, particularly along the leading edges. The females, like other Sympetrum are yellow-brown, but both sexes have two-colour eyes, red on top and blue-grey below. 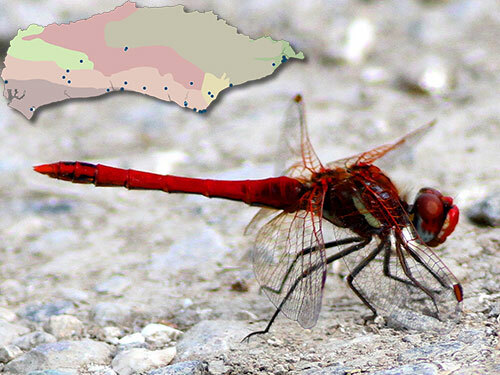 There are only three recent records of Yellow-winged Darter (S. flaveolum) in the SxBRC database. Slightly smaller than the other similar Sympetrum species, Yellow-winged Darters of both sexes have black markings along the sides of their abdomen and wings with a marked yellow coloration close to the body. The final Sussex Sympetrum is S. vulgatum or Vagrant Darter, this species has only been recorded twice in Sussex both times during the 1960s. Very similar to Common Darter, the males can be distinguished by the presence of a row of tiny yellow-ringed black dots along the abdomen and no yellow markings on the side of the thorax. The females have a small spur that points downward from the ninth abdominal segment. All the Sympetrum can be seen flying between June and October or even November in warmer autumns with August being around the peak of the flight period. When the weather is warm with southerly airflows from mainland Europe, as it is this year, there is a strong possibility of migrants arriving along the coast of Sussex so it is well worth having a closer look at these dragonflies, especially if seen in coastal locations. 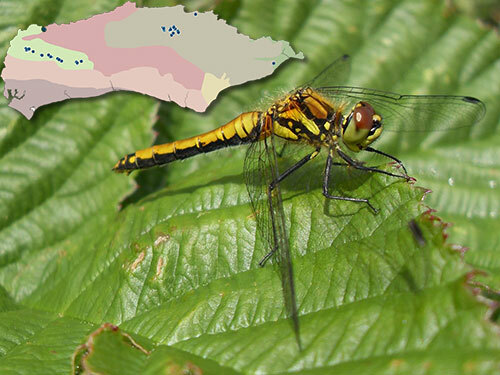 As can be seen from the maps there are plenty of places in Sussex for which we have no records so, If you do see a Sympetrum species (or any other dragonfly, for that matter), please record it on the iRecord website, ideally with a photograph that shows any of the distinctive features mentioned above. 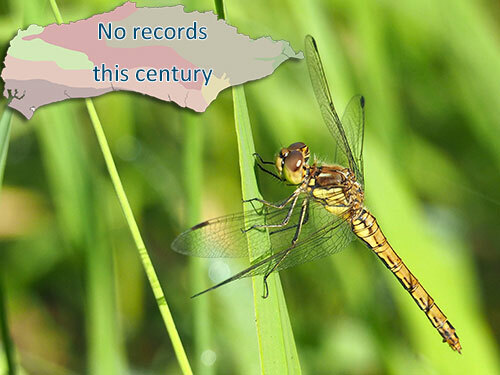 Or if you prefer, send your records directly to Bob Foreman at the SxBRC and they will be passed to both the Sussex and British Dragonfly Societies.